On this Flashback Friday, a look back at one of my favorite photos I have snapped here on this blog over the years in Alexandria, Virginia. 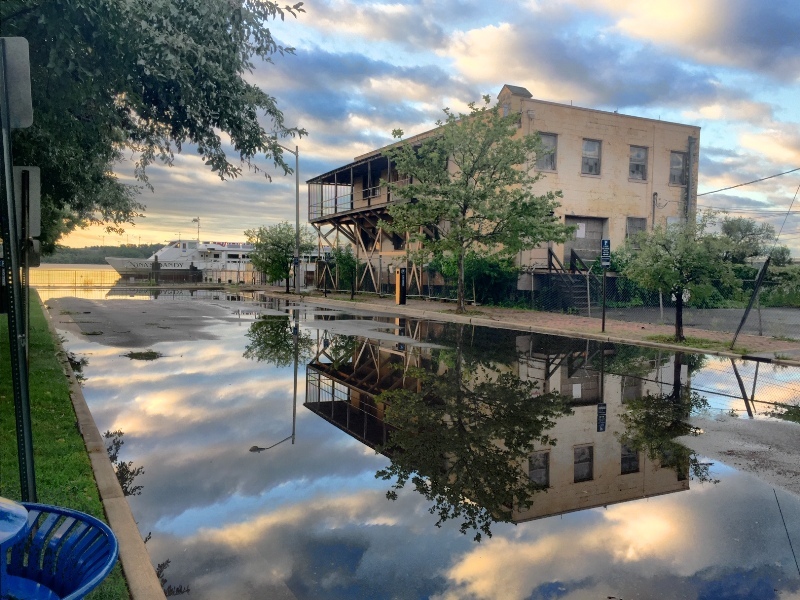 I snapped this photo of the Beachcombers Restaurant after an overnight rain flooded the Alexandria, Virginia waterfront back in late June 2015. The original building on the site where the Old Dominion Boat clubhouse now stands was called the Beachcombers Restaurant which later became Potomac Arms. See the fantastic presentation below from Alexandria Archaeology volunteer Diane Riker (see others at this link) on this site. Well before the Woodrow Wilson Bridge was built, many an Alexandrian would gather on the rooftop of the Beachcomber in the mid-1940s to watch the nightly steamer to Norfolk load up. Legend also has it that since the Beachcomber was built out over the water, the restaurant was actually located in the District of Columbia (water line is still the border to this day) and therefore closed much later than other Alexandria pubs. Since it was in the water and therefore outside the City limits, gambling was also allowed.